Mutton and Mead is a Knighten Guild and Company Project. To find out more about the Knighten Guild click here. What is the Mutton And Mead festival? The Mutton & Mead Tavern & Inne (a fictitious tavern that comes to life once a year) is hosting its annual festival for your enjoyment! Come partake in merriment and play as our shire transports you to another time: Merchants hawking their wares, Games to test the skills of both children and adults, Stages showcasing the realm’s finest entertainers! Wander the streets listening to minstrels infusing the air with music. Meet Robin Hood and his Merry Men as well as Maid Marion! Stroll the enchanted paths of Sherwood Forest. But watch out for the Sheriff! 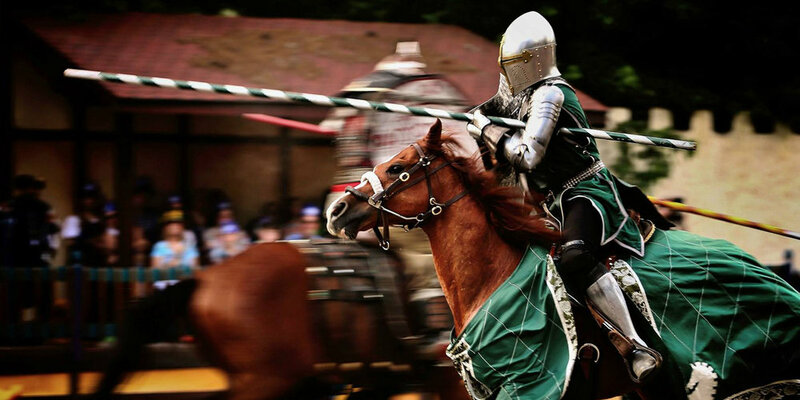 This festival, brings together theater, fun, food, and entertainment with a medieval flair. It is a day for everyone: kids, teens, and adults alike. Come in costume or come as you are, and enjoy the festival! WHY SHOULD YOU GO TO THE FESTIVAL? To... See the a full armored Joust on horeseback! To... Be entertained by sword fighters, Mud beggars, Wenches, Belly dancers, Singers, Minstrels, Jugglers and More! To... Shop the shire's Market and Adorn Yourself with Gifts from over 65 merchants and artisans selling fantastic leather work, jewelry and other treasures! To... Play with the faeries and wood sprites of the enchanted Sherwood forest. To... Partake in the shire’s fine Mead, smoked Turkey Legs and other Tasty Victuals of the Land! To... Meet the wonderful people of our shire, including Robin hood, his Merry Men, and Maid Marion as the legendary tale unfolds around you. So travel back in time with us to the early 13th Century! The Mutton and Mead Tavern will be holding their annual summer festival, and collecting food for the poor. The shire folk are worried the Sheriff of Nottingham will come and exact tax payment on the collected food, but are confident that Robin Hood will swoop in and save the day! Mutton & Mead is a project of the Knighten Guild, in cooperation with the Millers Falls R&G Club. Mutton and Mead aims to offer patrons an experience that is entertaining, enlightening and lively while also providing a venue to members of the local and extended community to showcase their talents as performers, educators, crafters and artisans. Are we a medieval or renaissance festival? Medieval and renaissance festivals have much in common. However, each pulls its respective themes from the culture and events of two very different periods of history (either the medieval or renaissance time period, which are hundreds of years apart). We have decided to begin with the medieval period, but wish to allow flexibility so that in the future we can tell stories of other time periods both real and imaginary. Once the theme of a festival is determined, the approach and goals are akin. Both medieval and renaissance festivals breathe life into the past by having actors and actresses populating the streets and playing out scenes in character and in costume. Stages throughout the marketplace offer comedy, music and drama during the day of the festival. In the market, vendors and craftsmen demonstrate their trades and sell their wears. Games abound for both children and adults to have fun and test their skills! The scents of perfume and delicious foods saturate the air. Merriment, mirth and music permeate! What are we? We have decided that we are a tavern: "the Mutton and Mead Tavern", and this is their annual town festival... an Old Home Days, in the days of the Shires. But more than just any tavern, the Mutton and Mead is one that has thrived throughout the ages. Revered almost as an elderly relative, it is said that this tavern, the Mutton and Mead, has sat nestled in these same idyllic hills of this (fictitious) shire in England for centuries. That in part may explain the fame and love she elicits from her patrons. While the social and political landscape changed, the Mutton and Mead has not, catering to each generation of beloved patrons while staying true to what had become her legacy. For centuries shire folk and travelers have visited this tavern and alehouse, THE MUTTON AND MEAD, be it on their way home from a hard day’s labor or to tend to their appetites whilst resting their horses before continuing on an arduous journey. The tavern plays a central role in shire life. It is a place to meet with friends, to play games, to sing, to hear the news and gossip of the day and to simply to forget one’s hardships. People flock to the tavern as the sun sets behind the hills and light cascades from the tavern’s windows... luring all to where they know great victuals and grand times await them. Each year the Mutton and Mead tavern throws a festival drawing in entertainers, artisans, merchants and folk from both near and far. The streets become a flurry of activity with merchants hawking their wares, games to test the skills of both children and adults, and wandering minstrels infusing the air with music. Street performers demonstrate their talents while trying not to distract too much of the visitors’ attention from stages where the inne showcases a variety of acts which have made a name for themselves. Because of the Mutton and Mead’s renown, one never knows who might be seen walking the streets. Often nobility stop by while on progress through the shires of olde England. Mutton and Mead traces the life and incarnations of a tavern over the centuries as well as its visitors who are both historical and imaginary figures; making history come alive in a lively manner. However, Mutton and Mead is more than just a tavern. “She” is a vessel we aim to use to transport patrons back to times immortalized in the stories we have all heard. We intend to build a participatory community event that entertains, inspires, educates and most important, becomes an eagerly anticipated annual tradition. Whatever your interest, you will find something that resonates with you at Mutton and Mead, be it the entertainment, the food and drink, the merchants, the games or the joyous union of all these elements. In our first year, 2011, we kicked things off with “Thieves of Honor”, a retelling of the legend of Robin Hood. While we all know the story, at Mutton and Mead we are bringing the beloved characters to life so that the story unfolds around you and you are immersed in it. You can even take part as the story unfolds! However ancient the Mutton and Mead may be, one thing is clear... these tavern walls have witnessed more tales than a scribe could write in a thousand books! It is this uncontested fact that helps fuel a local legend about the Mutton and Mead; the belief that if a person is to become renowned in history, chances are that they will or already have paid a visit to the Mutton and Mead. The magic engendered by the Mutton and Mead has a peculiar way of making this happen. This belief will be exploited in the years to come and as the festival evolves. I think you know why!